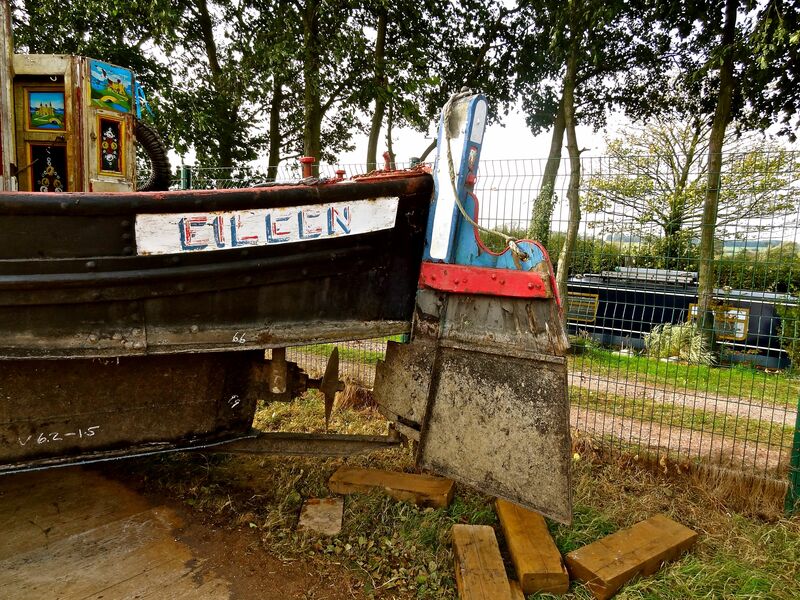 The Story of Eileen – a new chapter : Part 2. In the first week of October 2011 John Sharpe of Great Haywood Marine Services and Keith Myatt moved Eileen from her mooring between James Brindley’s 1790’s Trent Aqueduct and Anglo-Welsh’s Canal Wharf, and took her the short distance to Great Haywood Junction, turning left beneath Bridge 74 up the Trent & Mersey to Great Haywood Marina and John’s workshops. It turned out she’d spend nearly six months here undergoing the first part of her renovation. But, I’m getting ahead of myself, at this point in early October 2011 she still wasn’t even ours, a decision may have been made in our minds, but no money had changed hands, and there remained huge uncertainty. It was a time for pragmaticism and practicalities, as both the finance and the way forward, depended totally on hauling Eileen out the water and her achieving a survey sufficient for insurance purposes. Fortunately John’s firm possessed a huge, low-hung ‘cradle-on-wheels’ which was pushed into the water by a tractor of equally epic proportions. The boat was manhandled into the cradle, secured and the whole lot dragged out of her element onto the hard. A first informal visual assessment showed what everyone suspected, that the hull was at best ‘a bit of a dogs breakfast’. It turned out to be a complex crochet-work of original riveted iron plate, and areas of over-plating steel sheet from different periods (over-plating had definitely taken place in the late ‘60’s and again in the early ‘90’s for example). In addition there were a number of heavily pitted sections, particularly at the stem and stern, that required immediate attention. 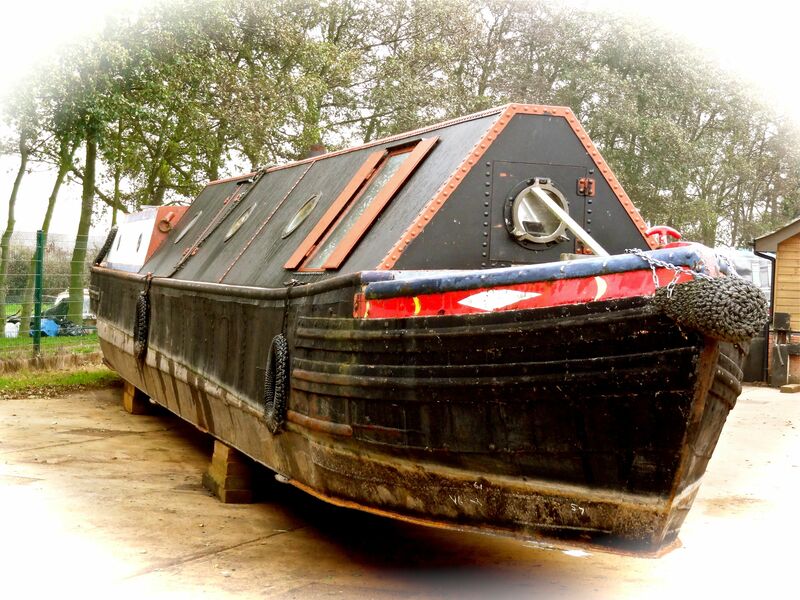 Surveying an old boat is a particular skill, and not one that all surveyors relish. I spent hours on the phone seeking advice on who the most appropriate surveyor might be. I spoke to Malcolm Braine and previous surveyor Michael Clark who’d surveyed the boat in October 2006 prior to it being sold by Jim MacDonald to Lesa Vallentine (she bought the boat on 20th March 2007). I eventually found surveyor Rob Tropman of William Rosie’s Marine Engineering Services of Chesterfield. On 11th November 2011 Eileen was surveyed and the outcome shared with me over the phone that afternoon. Rob’s first comments were reassuring, the boat’d come in under 7 foot, so the gloomy forecast that her spreading waistline might prevent her being moored on the South Oxford proved unfounded, she was slim and trim – unfortunately, and you could hear the ‘BUT’ coming, that was where the good news ended. The yard had previously said, “…so long as the hull and engine are sound, everything else can come later…” Sadly both engine and hull were far from sound. Despite a previous over-plating efforts, pitting in the baseplate had, in places, left just a couple of millimetres of metal. There would need to be extensive additional plating before the boat could even be safely returned to the water, never mind guaranteed for insurance and financing purposes. “She’s currently uninsurable…” Rob said, “and the engine needs a rebuild or replacing.” … in a nutshell we were stuffed! I reeled away from the phone, resigned to the fact that despite all my optimism, at this first hurdle we’d seemingly lost Eileen. The expense of making good the defects identified in the survey would run into thousands of pounds. The time for misty-eyed romanticism about family and boat and the water road were put to one side, and hard bargaining followed based on the fact that an independent surveyor had pretty much concluded that without serious work being done, the boat was close to being unsellable for anything like the original asking price. Negotiations swung back and forth. The vendor had invested a fortune in having the hold converted to a high standard, and suddenly she faced the prospect of seeing no return on her investment at all, far from doubling the value of the boat as she’d hoped, the inherent weakness of the hull meant she was facing having to right off her investment and with it her dreams. Respect, horse-trading and honesty led to a fair price finally being agree, one that reflected the cost of works to be done, and over a third of the original asking price was wiped out. With an in-principle price agreed there then began an odd in-limbo period when the boat wasn’t actually mine but I was committing thousands of pounds to have the renovations completed to the point where the surveyor would sign off the works and sanction the finances being released. Held breaths all round. It was an act of faith and trust in strangers I’d probably not have risked in any other place than the Cut. Dave Izon, the welder, identified a twin-track solution to the weaknesses in the steelwork agreeing with the surveyor that 30′ of over-plating was needed, roughly divided into 15′ at the stern, and 15’ at the bow, and that remaining thin-spots, in the central section, could be addressed through spot welding. In just 48 hours, with reassuring goodwill on all sides, we’d hammered out a way forward. The boat moved from the temporary inspection cradle to being ‘chocked up’ on the bank ready for over-plating. The vendor signed an interim sale agreement stating that the works to make good the boat could begin. My boat/her boat/my money/her money/my dreams/her dreams wedded together by circumstance and a sieve of a boat high and dry out the water. 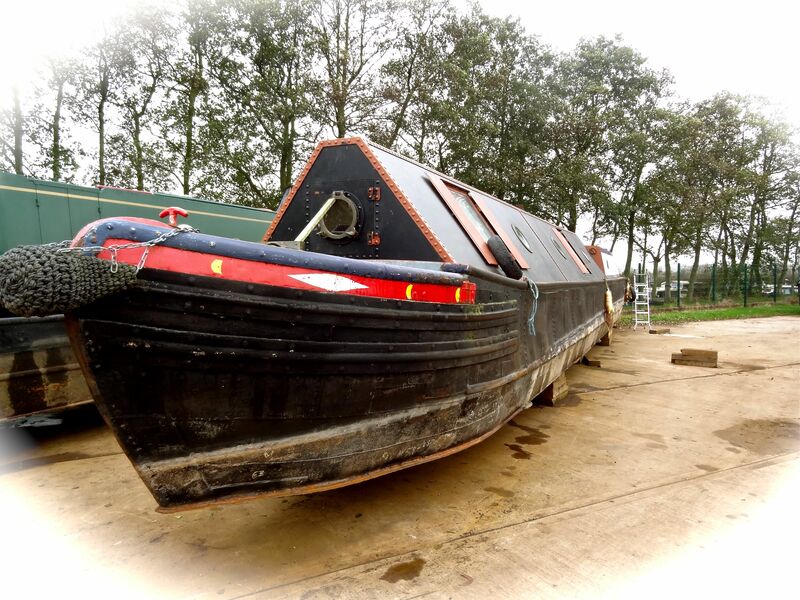 The welding, the issue that’d caused such a headache was remarkably resolved within a fortnight, and the hull blacked and looking in good order, by the time I visited in late November. 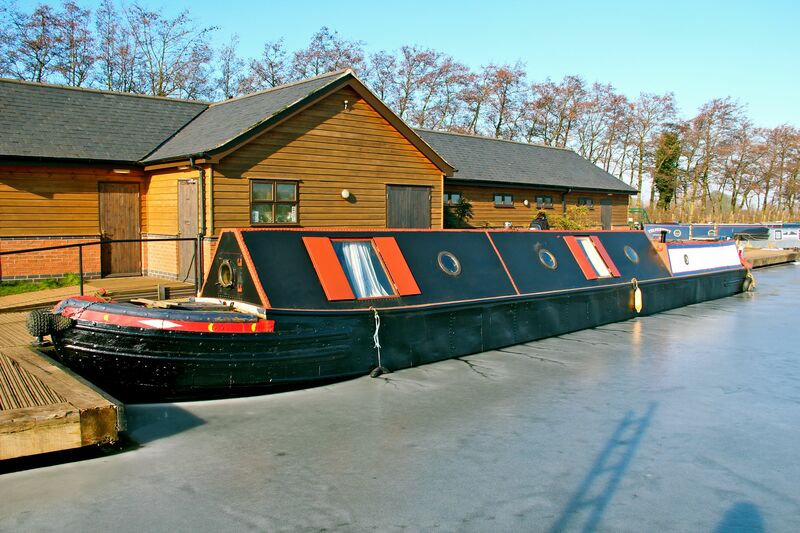 The works enabled the contracts to be exchanged and on Saturday 19th November, Eileen passed into our ownership. 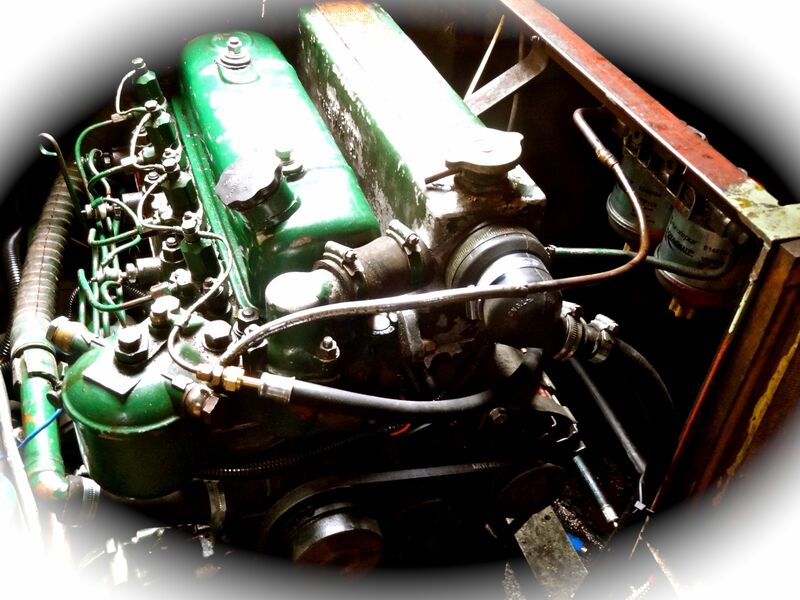 And so began a period of manic renovation, through the mildest and most benign of Winters the 23HP BMC 2.2 engine was pretty much rebuilt, the wiring loom replaced, a new fuse box and engine panel fabricated; Derek Luker created a gas system and plumbing and bulkheads went in. Water flowed, the roll-top bath and the sink had hot and cold running water for the first time. Eileen came to life. During this flurry of activity our family involvement felt out-of-kilter and very arms-length. We were just too far away to drag the kids up the motorway each weekend, and the rest of life seemed to get in the way of focusing on the boat in it’s totality; so I compensated by focusing on details, spending hours rubbing back, sealing and re-sanding the wood and steel elum or tiller, and in doing so made a least a small contribution to the overall renovation from the confines of a dusty storeroom at school where I worked on the elum as time allowed. I began to take more seriously writing the blog of the boat too, and it went through several incarnations as the months passed. Eileen re-entered the water on schedule in the first days of February and there was general optimism that she’d be up and ready for leaving by Easter, that was until the Big Freeze set in. The sudden bitter-cold weather took everyone by surprise, just when Spring seemed to be around the corner, the canals and everything on and around them froze solid, and work stopped. Next Next post: Silent Sunday 60.